“Now, don’t get panicky, Ethel!” exclaimed a very panicky Lucy Ricardo to a calm, composed Ethel when she comes into Lucy’s cluttered apartment in a classic episode of I Love Lucy. 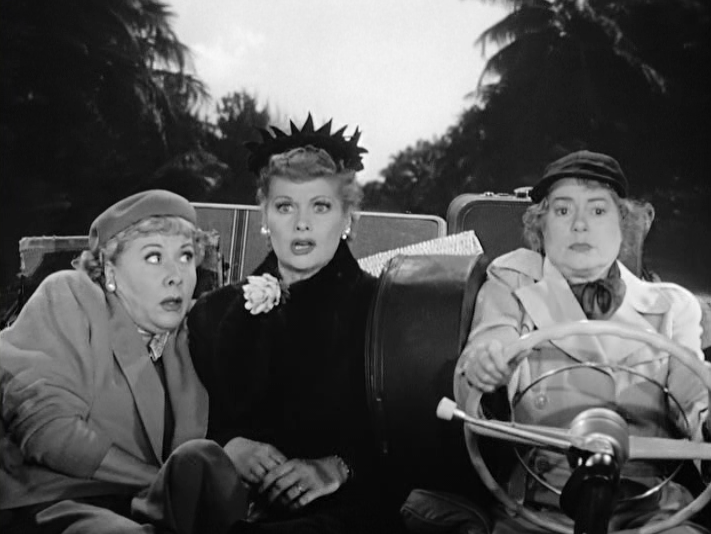 In “Off to Florida”, Lucy and Ethel are supposed to join Ricky and Fred in the sunshine state, but Lucy loses the train tickets the day of their departure! Lucy’s been frantically searching every nook and cranny of her home in search of those tickets. Her wide eyes, short breaths and frenzied behavior are classic symptoms of panic. And, while Lucy’s symptoms are hilarious to watch, I know from experience that in real life, it’s not so funny. A year ago, I was scheduled to go to Chicago to speak at a ladies conference. My topic was “peace”. My problem was that I didn’t have much of it. At the last minute, I got scared of flying. I began to imagine every possible scenario where “death” was the final result. I was traveling alone, so I could give my imagination my full attention. I wasn’t used to that. I am used to being around five kids all day, being questioned non-stop, and doing 5,741 chores a day. Being alone with no questions or chores was new. Needless to say, I allowed my imagination to carry me off into the sunset. I spent two very sleepless nights, and barely got home in one piece. The worst part, even now, is knowing that I was absolutely no help to those sweet ladies in Chicago. In fact, I’m afraid that my anxiety was a distraction. Fast forward to this year – nearly the same thing happened again, only this time, it wasn’t about flying, it was about my health. In the night, when my thoughts and I were alone, I turned minor health issues into terminal illness. In each situation, my breathing came in short, shallow puffs, my heart pounded as though I were running a race and I just knew that death was near. The interesting part about both times was that I wasn’t frightened about where I’d go when I’d die. I knew I’d be with the Lord. I was panicky for my family. Thoughts like, “What will they do?” or “Will they forget me?” or “Will someone else raise them?”” filled my brain. These thoughts just compounded my problem. I’m a little nervous about even sharing my story , because any rebuke or Phariseeical remarks will hurt deeply. But, maybe God can use my distress to help others. Since last September, I’ve read several books by Christians on anxiety, worry and depression, so I know I’m not the only Christian lady to walk this path. Perhaps this post can help that lady who suffers in silence, the one who cries alone in her bathroom, who begs God for relief, only to get no immediate answer. I want to say that there is hope. First of all, I have not arrived at a permanent solution. In fact, that was my first mistake – I expected complete healing. I would have a few good days, thinking the anxiety was in my past for good! Then, I’d take a nosedive. When that happened, I would give up hope, allowing the anxiety to return with greater efficacy. I’m kind of a “all or nothing” kind of gal. The Lord is teaching me to be a “one minute, one hour, one day at a time” kind of gal. Here are the steps to peace that God has given me in the last year. The first step was realizing I had backslidden in my prayer life. In fact, I was hardly praying at all. I had convinced myself that God knows everything and He knows what’s best, so why pray? He’ll take care of things. The issue was that my attitude, while recognizing God’s sovereignty and wisdom, was an attitude of disobedience! He tells me to pray (Matt. 26:41; Luke 11:1-3; Luke 18:1; 1 Thess. 5:17 and many more), so I should pray. The Lord so gently and lovingly guided me – because I was crying out to Him about my anxiety. Most of my prayers were, “Help me, Lord! What’s wrong with me?” I’m here to say that He answers the prayer of the panicky. His answer came this way: My husband had renewed his subscription to Tabletalk magazine. With that renewal came a free gift, a copy of “Does Prayer Change Things?” by R.C. Sproul. I held the book in my hands, already having felt pricked by the Holy Spirit for my indifferent attitude about prayer. As soon as I saw it, I knew I should read that little book. Through various statements and scriptures, I fell under conviction about my lazy prayer life. I asked God to forgive me, and to help me pray. I even wrote a blog post about it, and gave away a copy of that book to a dear reader. Then, just four days after I wrote that blog post, a wonderful pastor and friend of our family came to preach at our church. His sermon that Sunday morning? That’s right, it was on prayer! I wept and rejoiced at how God was answering the cry of my heart. It was like He had come to sit beside me at church that morning and personally answer my questions and guide me. Just thinking about it brings tears to my eyes! I began implementing a more systematic prayer schedule each morning, even if it meant getting up a little earlier. I already read my Bible every day, but my prayer time was easy to push aside. Talking to God faithfully each morning has helped me more than words can say! I have seen answers to prayer almost daily, but most of all, I’m keeping my sins confessed. (It’s amazing how quickly I can covet something in my mind or think a hateful thought about someone!) I have finally found the peace that I was missing in Chicago. The second step was exercising outdoors. I’ve always exercised regularly by doing indoor aerobics. When I had little children and Terry was at work, I couldn’t leave them to go for a walk. There were too many of them to take with me if I wanted to go fast, so I did DVDs in my bedroom. Last June, Terry and I started doing the couch-to-5K app. The sunshine and fresh air gets my day started off right. An added bonus is getting to see God’s creation wake up each morning. It reminds me of how tiny I am compared to Him, and yet He loves me – yes, even when I panic. The third step was reading a book. Several weeks ago, my sister recommended to me the book Loving God with All Your Mind, by Elizabeth George. It was as though God put that book in my lap to answer the remaining questions I had. I had been praying, “Lord, show me what to do. Do I need medication?” I am fully aware that some hormonal conditions require medication. I’ve been on medicine in the past, and am not opposed to it. Like most people, I want medication to be a last resort. Terry and I prayed about my issues and I picked a doctor from the phone book. She was not kind and I left her office in tears. I took that as God saying “No” about medication for the time being. I was back to square one. That’s when I remembered that book! Before I even picked it up, the Holy Spirit reminded me of 2 Corinthians 10:5 Casting down imaginations, and every high thing that exalteth itself against the knowledge of God, and bringing into captivity every thought to the obedience of Christ; If only I could control my thoughts better! My thought life seemed to carry me away on wings and lead me off to worlds of worry! I wanted to apply that verse, but how? How can I bring something “captive” that I can’t even touch? The first chapter in Mrs. George’s book held my answer. She shares her own struggle with depression and that her thoughts were the problem. She began memorizing Phil. 4:8 while doing dishes. It says, Finally, brethren, whatsoever things are true, whatsoever things are honest, whatsoever things are just, whatsoever things are pure, whatsoever things are lovely, whatsoever things are of good report; if there be any virtue, and if there be any praise, think on these things. One day, like a bolt from the blue, she realized that her fearful thoughts came from thinking about things that were not true. That was the part of the verse she focused on. If she started thinking the “what if” thoughts, she would stop and ask herself, “Is this true?” Well, most “what ifs” are useless, they are not true. She talked about how she got depressed thinking about the past, and fretting over the “if onlys” of life. But, the past was no longer real, it was over. She began putting her thoughts up against the “Is this true?” test on a daily basis. Soon, she was reining in her thoughts and only dwelling on the real, the true, the “right now”. This was my answer – this is how I could bring my thoughts into captivity! I began working on this around the first of October, and in these past few weeks, I have seen God change my thought life. But what about real problems? I have a few of those. I have a few family members who seem to hate me, and no amount of apologizing, explaining or loving can shake them from their position. To say that it’s caused stress in my life is an understatement. It’s been the source of much of my anxiety, sleepless nights, tears and heart palpitations. I want everyone (especially my family) to like me, so not being able to fix this hurts tremendously.The fourth step is learning to let go of that which I cannot control. I’m learning (on a daily basis) to take the real problems to the Lord each day in prayer, and leave them with Him. He holds the situation tightly and knows just how to handle it. When I start to stress about this, or any other real problem, I think of it like this: What if I read the paper and saw that another crisis similar to that of the Apollo XIII disaster was happening right now in space. What could I do? Could I rush down to Houston, roll up my sleeves and start doing physics? Umm…no. I can’t do physics. Even if I were a scientist, I don’t work for NASA. They would’t even let me on the property! It’s out of my league! Some problems are like physics. I don’t understand them; they are simply out of my league. All I can do is pray and trust God. And I’m learning that trusting God is enough. I still experience ups and downs. Some days, my tears still flow, and I feel alone, afraid and desperate all over again. But that’s the last step, knowing that ups and downs do not equal failure. I am trying to foresee thought patterns and prepare for them. For example, each time a family member visits, I might think, “This could be the last time I see them!” That naturally causes me to start feeling unnecessary grief. Since I know how I am, I’m preparing myself for those emotions in advance. My answer is quickly becoming my new motto: “Is that true?” Did the Lord come down and say that that would be the last time I’ll see them? Of course not! When those thoughts come, I’m ready. I think. I’m taking it one day at a time. Recently, my husband preached a message on trusting God. It was very good teaching from the Bible, but the last sentence of the sermon has stayed with me. He said, “Even if you choose to worry your way through life, the Lord will still be the same and He will still do the same. His faithfulness to you is unwavering, even when your faith in Him is weak.” That’s my security, and it’s been there all the time. My sanity and peace of mind do not depend on me. Yes, I want to develop godly habits and do right, but I will fail. It’s so comforting to know that He never fails. Sometimes, my husband helps me through the hard times, when the panic is just beneath the surface of my mind. His words of wisdom? Thank you for sharing your journey. Surely we all battle varying degrees of this same problem. I know I do. You have given good counsel, and I plan to check out the Elizabeth George book. I love you, and that is true. Think about it. I love you, too. Thank you for always being there for me. As I began reading your post, I thought immediately of that book by Elizabeth George. I read it a few years ago, and it was extremely helpful to me, as I am a worry wart myself! I tend to imagine the worst possible scenario for everything, but I am working on it. Thanks for being open and honest. I think that this is a struggle that a lot of women have. Thank you, Amanda! You are always a blessing! Wonderful post, Valerie. I know God will use this to help others. It helped me. Love you, friend. Thanks Valerie. I always appreciate your openness. Praise the Lord for using you through writing. Thank you, Melissa. I appreciate your kind words. Thank you, Audri! Thank you for being such an encouragement. Valerie, I’ve never dealt with depression or anxiety but I know ladies who have and I can’t image how it must feel. I’m glad you found some ways to combat it. Besides the obvious walking with The Lord I am a huge believer in physical activity to combat depression. There’s something about getting outside and moving that makes you feel good about yourself. Anyhow, great post! Very sorry to hear about what you’re going through, Valerie. It’s a blessing to know how God is working in and through you, allowing you to go through the experience no matter how painful and frightening it has been for you. And yet He is drawing you closer to Himself and continually transforming you into the image of our Lord Jesus Christ. Thanks for sharing your story. I’m sure many women will benefit from reading this. Praying for you. Huge hug and kisses from London! Love to you and the family! Have a great week ahead.